Google recently decided to club all their privacy policies into a unified version. The reason Google provided was that they wanted to provide a personalized experience by combining all the information across the services they provide. However, this change has caused a lot of people to become paranoid. In fact, Google has also received warnings from the EU among others. People have been deleting their Google history so that Google does not hold this information any more. Well, is that enough? Actually not, so the good folks behind "Joy of Tech" have come up with a foolproof way on "How to keep Google from watching your searches". Do make sure to follow all the steps . And yes, it is Friday and this was another episode of our Friday Fun . Just found a interesting way to create a matrix effect using Notepad and command prompt. Hat tip goes to Jeff who commented on our earlier article about 10 Amazing things you can do with Notepad. Save the file as matrix.bat and double click on it to see a Matrix like effect. Happy Friday, visit Friday fun for more funny articles and jokes. It has been a long time since we did Friday Fun, but seriously we haven’t had time, to have fun in the past few months :-(. However, after a hugely popular series of Twitter humor, in the form of Bringing the fun back to Twitter and Twitter humor once again, we decided to spread our wings and include some funny cartoons depicting Facebook. So go ahead, feast your eyes and ROFL (Roll on the floor laughing) while you view these funny images and cartoons for Facebook, and of course our funnier commentary to go with it. Did You Read the Facebook Terms of Services? Everyday? Dude, my Online Friends on Facebook Love me Better!!! Shouldn’t it be, Dude Let me Update my Twitter Status? 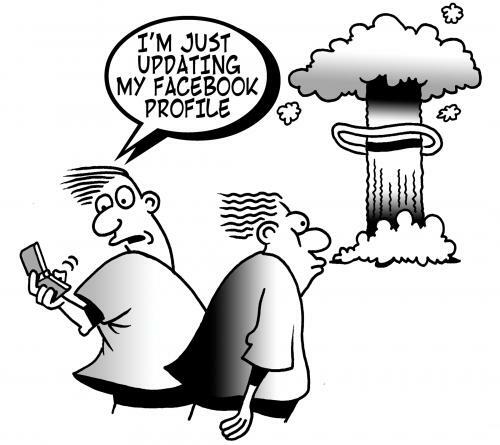 Creating a Bomb Everyone App on Facebook would be Fun Right? Well that’s it for now, too much of Facebook :-). Before you head someplace else, don’t forget to show your love and become a fan of Techie Buzz on Facebook.